F-16C (single seat) and F-16D (two seat) variants were introduced in service in 1984. The Block 25 was the first C/D block. It added all-weather capability with beyond-visual-range (BVR) AIM-7 and AIM-120 air-air missiles. Block 25 introduced a substantial improvement in cockpit avionics, and improved AN/APG-68 radar. Block 25s were first delivered with the Pratt & Whitney F100-PW-200 engine and later upgraded to the Pratt & Whitney F100-PW-220E. A total of 209 Block 25 aircraft were delivered. 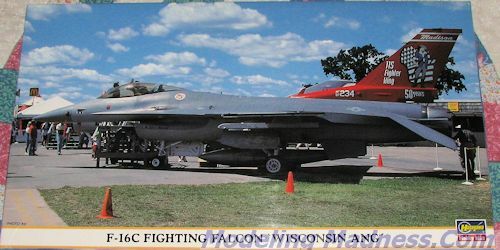 The F-16C/D had a unit cost of US$18.8 million (1998). The USAF has pretty well started thinning down its F-16C fleet with the Block 25 planes being relegated to the bone yard as well as a goodly number of the later Block 30/32 versions. This is due as much to budget issues (like paying for the super-expensive F-35) as much as the age of the aircraft. 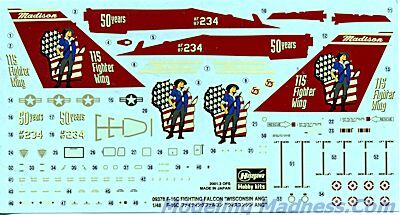 Hasegawa's F-16 kit has been around for an age and when they developed the F-16C, rather than changing the panel lines and such on their F-16A kit, they simply added the appropriate F-16C bits. This, of course, threw some modelers into a pique of rage at how Hasegawa could possibly foist such a Frankenstein's monster on poor, unsuspecting modelers. Most of us have survived with minimal trauma. This boxing was released in 2001 so the molding is still quite nicely done. There are the usual small ejector pin marks on missiles, gear legs, wheels and so on, but that is pretty standard stuff with kits of this generation. The engraved detailing is quite nice and most will find it to be pleasing. Despite the wings having upper and lower halves, Hasegawa has decided that we need all the pylon holes opened for us. While on the wings, these do not have the 'beercan' antennas that were retrofitted to US F-16Cs. The cockpit is nicely done and comes with a pilot figure to cover up the somewhat generic Aces bang seat. Decals are provided for none of the instrument panels, the modeler needing to paint the nicely done raised detail on these items. During constructions, a few holes will need to be opened and some bits cut to match the proper variant or to have some features in their optional position. This is especially true of the speed brakes, which one almost never sees open on the ground. One of the more complex constructs is building the afterburner petals up into a circle. I seem to recall this being a tad fiddly when I last built a Hasegawa F-16C many, many years back. One of the other options is having the cockpit canopy open or closed. Hasegawa provides both clear and lightly tinted clear bits. Both have a seam running down the middle that will have to be sanded away. Modern jets need to have things under the wings so this one provides a centerline tank, two huge wing tanks, a bomb pylon, and a missile pylon. For weapons, you get two Sidewinders and two AIM-120. A travel pod is also provided. Instructions have the usual Gunze paint references and show that nose weight is recommended. Markings are for the box photo plane in the later two greys scheme. Decals are old school where the whites are off-white. You are provided separate fin markings in case you'd rather paint the fin, so that is a nice touch. I would probably be correct to say that this kit has been built by the tens of thousands over the years and Hasegawa is still using the basic bits to do other boxings. I know the last standard F-16C boxing I reviewed several years back retailed for $45, something that definitely deters some modelers from going the Hasegawa route for their F-16. However, for those who like F-16s, it can easily be found for a most reasonable price from various vendors at hobby shows.